As routes get higher off the ground, the increased risk of life-threatening injuries necessitates additional safety measures. 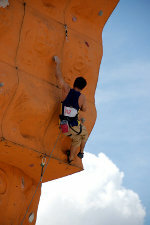 A variety of specialized climbing techniques and climbing equipment exists to provide that safety. Climbers will usually work in pairs and utilize a system of ropes and anchors designed to catch falls. Ropes and anchors can be configured differently to suit many styles of climbing, and roped climbing is thus divided into further sub-types that vary based on how their belay systems are set up. The different styles are described in more detail below, but, generally speaking, beginners will start with top roping and/or easy bouldering and work their way up to lead climbing and beyond. In top-roping, an anchor is set up at the summit of a route prior to the start of a climb. Rope is run through the anchor; one end attaches to the climber and the other to the belayer, who keeps the rope taut during the climb and prevents long falls. 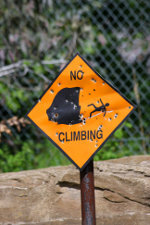 This type of climbing is widely regarded as the safest type of climbing, with the lowest chance of injury. 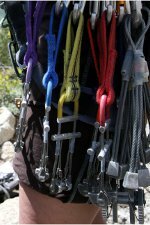 In lead climbing, one person, called the “leader”, will climb from the ground up with rope directly attached to his or her harness (and not through a top anchor) while the other, called the “second”, “belays” the leader by feeding out enough rope to allow upward progression without undue slack. 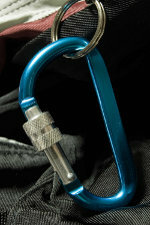 As the leader progresses, he clips the rope through intermediate points of protection such as active cams, or passive protection such as nuts; this limits the length of a potential fall. The leader also may clip into pre-drilled bolts. 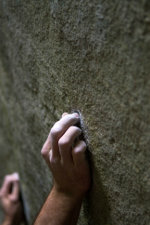 Because the climbing rope is of a fixed length, the leader can only climb a certain distance. Thus longer routes are broken up into several “pitches”; this is called “multi-pitching”. At the top of a pitch, the “leader” sets up an anchor and then belays the “second” up to the anchor; as the “second” follows the route taken by the “leader” she removes the equipment placed along the way in order to use it again on the next “pitch.” Once both are at the anchor, the “leader” begins climbing the next pitch and so on until the top is reached. Climbing communities in many countries and regions have developed their own rating systems for routes. Ratings (or “grades”) record and communicate consensus appraisals of difficulty. (Hence, there may be occasional disagreements arising from physiological or stylistic differences among climbers.) The ratings take into account multiple factors affecting a route, such as the slope of the ascent, the quantity and quality of available handholds, the distance between holds, ease of placing protection and whether advanced technical maneuvers are required. 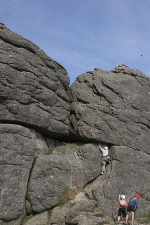 Whilst height of a route is generally not considered a factor, a long series of sustained hard moves will often merit a higher grade than a single move of the same technical difficulty. The typical rating system for top-roping and lead climbing is from 5.2-5.15b. There can be debate on the difficulty rating. Typically the rating for the hardest move on the wall will be the rating for the whole climb, although sometimes climbs are rated for endurance factor. 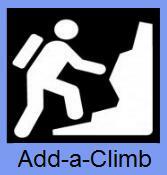 For example, a climb can have multiple 5.11 moves with no rests and thus be rated 5.12. The most commonly used rating systems in the US are the Yosemite Decimal System and the “V” bouldering grade.